The 2019 Summer Day Camps at the Red River Zoo are week long experiences where children will participate in various activities throughout the zoo. Participants will take part in outdoor adventures, creating crafts, play animal themed games, experience animal encounters, and more. Coordinated and led by the Education Department, children are sure to have an active and fun experience. Each respective camp session has a different theme that the children will explore throughout the week. 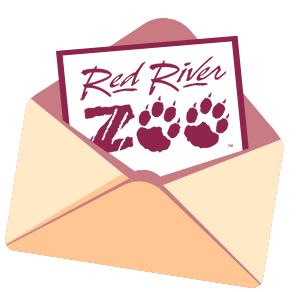 Join us to discover animals and their habitats while having a wild time at the Red River Zoo! One zoo camp shirt will be provided for each registered participant. Expand the accordian below to learn about Critter Camp, Explorer Camp, and Discovery Camp. Once you’re ready to sign up, click the button below. Have questions? E-mail us or call us at 701-277-9240, ext 310. Sessions run in the morning from 10am-12pm OR in the afternoon from 2pm-4pm. 1 hour early drop off option is available upon request. Travel the globe from the safety of the zoo in this adventure of a lifetime. Here at the Red River Zoo, we have animals from almost every continent on the planet. From the steamy rainforests of South America to the windy mountain tops of Asia, our animals come in many different shapes in sizes. Come and explore the similarities and differences that help each animal survive in their homes. Learn how parrots stay dry in the rainforest, explore how red pandas can balance in the trees, and discover animals that you can find in your own backyard. Join us this summer in this trip around the world. Passport not required. Come explore how we care for our animals here at the zoo in this camp designed for blossoming future veterinarians. How do we care for animals from fish to Pallas’ cats? What makes animals sick and how do we make them healthy again? Help us take care of a different “animal” patient each day. Then uncover how our animals work on the inside by exploring the digestive system and dig through hundreds of red blood cells. Finish the week off with bringing in and caring for your own plush animal. Sessions run in the morning from 9am-12pm and in the afternoon from 1pm-4pm. Do you have what it takes to be a Park Ranger? Learn about the different parts that make up the natural world as we build our own ecosystems. From rocks to rivers to trees each, everything has an impact on wildlife. Through building food chains and learning about how weather affects the environment, campers will leave with a greater understanding of our planet and how all aspects of the environment are important when looking at ecosystems. We will also learn from our animals and explore how their designs help scientist build things like buildings, sails, and wind turbines. Are you interested in becoming a veterinarian? Then this is the camp for you! Learn about how we care for our animals at the zoo and what makes them unique on the inside. Discover the many mysteries that studying poop can reveal! Next, learn about the biological side to how our animals adapt and survive different climates around the world. Activities will include growing your own germs, learning about different animals’ body systems, and we will meet with a veterinarian. This class will explore all parts of animals so make sure you have a strong stomach to see to look at the animals from the inside-out.